Operation Overlord 6 June - 20 July 1944. When I started I looked at the entire Normandy campaign from Operation Neptune, the D-Day landings, to the closing of the Falaise Pocket. But I found that task to be too monumental. In my experience Firestorm campaigns work better if they are smaller in scope. Smaller campaigns are also closer to company level and work better with Flames Of War games. I decided to break up the Normandy Campaign into smaller sections and start with the British and Canadian landings. I had already given the US attention in Firestorm Lorraine and felt it was time to give the British and Canadians their share. I do have plans for further Normandy campaigns if I have the time. In fact I think the next step is the US landings and the Cotentin Peninsula, followed by Operation Bluecoat, then Operation Cobra, Falaise pocket and possibly the liberation of Paris. I even have some ideas to link them together at the end. But that would only be for the most serious wargamers. Some gamers might think it is appealing to run huge campaigns but I have found that campaigns run best in small time frames. Sean Goodison at Battlefront has designed a great map and players familiar with this part of history will recognise the names of various places. In Firestorm Caen, there are just a few special rules that reflect the actual campaign. 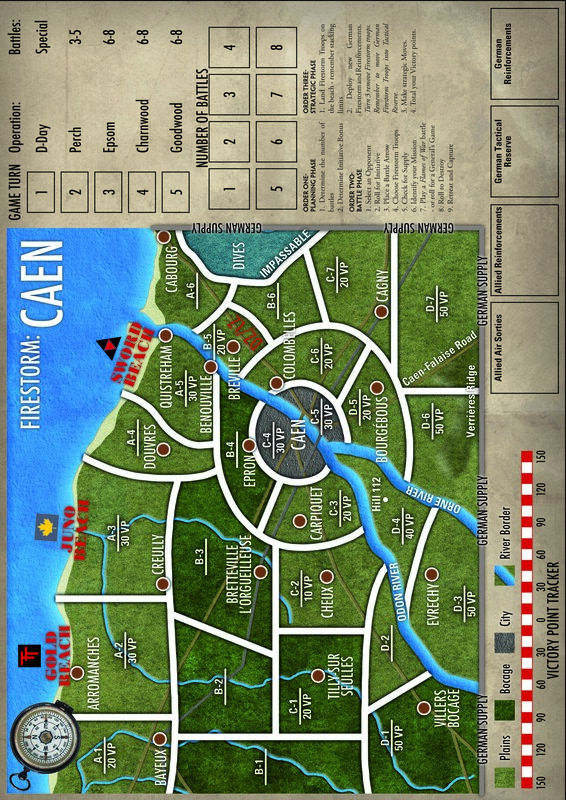 If players find that Firestorm Caen seems like a slogging match and battle of attrition then that is the desired effect. Yet even so there is room for tactical play and both sides will have to press hard to achieve victory. Turn One covers the actual airborne and beach landings and is carefully lined up. This will give you the opportunity to tie in the landings into a larger campaign. 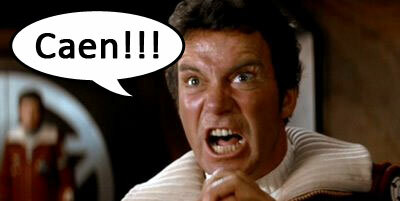 Then there are several special rules for this Firestorm campaign. The first rule is a stacking limit to Firestorm Ground Troops. The British and Canadians were numerically superior to the Germans but within the tight confines of Normandy they could not use their numbers to their advantage. It is very important for the British and Canadians to push constantly forward to make room for new reinforcements and try hard to use their superiority. The second important rule was to introduce German Tactical Reserves. This would give the Germans just a little flexibility in defence. This means the British and Canadians have to make the Germans commit their reserves before attacking on a different axis. 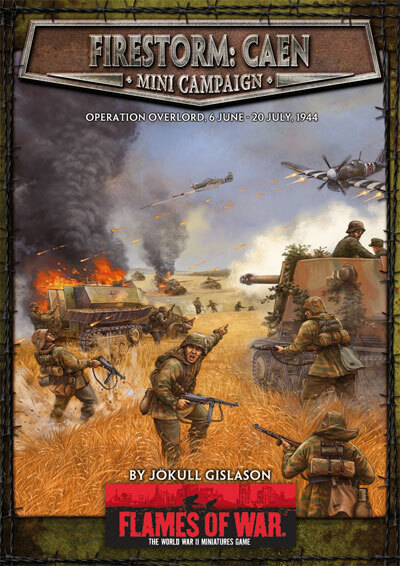 Then there are a few other minor rules like a special attack on Villers Bocage and Allied carpet bombing for turns four and five but all of these are clearly explained in the rules. 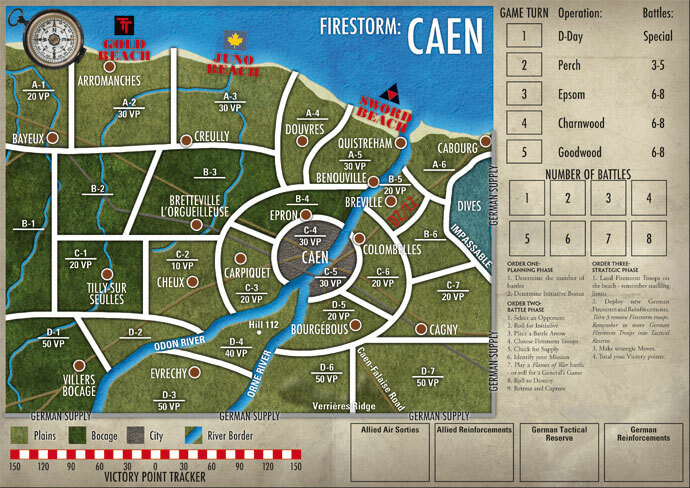 Firestorm Caen was quite a challenge and I do hope you will enjoy playing it out half as much as I enjoyed designing it. The whole point of Firestorm is to play battles that have an impact on the overall effort and tie together what would otherwise be random games. D-Day is unique in the annals of warfare and along with all the new models releases you can now bring this part of the World War Two campaign history to life with your games.